Thanks to an interview given in 1964 by Abbie Borden Whitehead Potter, niece of murder victim Abby Borden, we learn a little about the relationship between Lizzie Borden and the sisters of her stepmother Abby Durfee Gray Borden. Sarah Bertha “Bertie” Gray Whitehead, daughter of Jane Baker Gray and Oliver Gray, and mother of “Little Abbie” was a half-sister to Abby Borden, and by all accounts, the two appeared to be very close and affectionate. The Whitehead house, half of the Oliver Gray homestead, figured prominently in a real estate transaction in 1887 when Andrew Borden, Lizzie’s father, purchased the property and deeded it to his second wife, Abby, thus allowing the Whiteheads to enjoy the security of this house on Fourth St. after stepmother Jane Gray left to live with her daughter Lucy Eldridge Cahoon on Cottage street. Andrew Borden may well have regretted not keeping his two daughters apprised of his intentions in regards to this home, as it would cause great discord after the fact, resulting in Andrew Borden giving Emma and Lizzie the old Borden home on Ferry Street to assuage their wounded feelings. “What you do for her family, you should do for your own flesh and blood,” was a statement attributed to Emma Borden when she confronted her father about the transaction. Some who study the case trace this incident to the beginning of Lizzie’s all-out dislike of Mrs. Borden. It is at this time she stopped addressing Abby Borden as “Mother”. 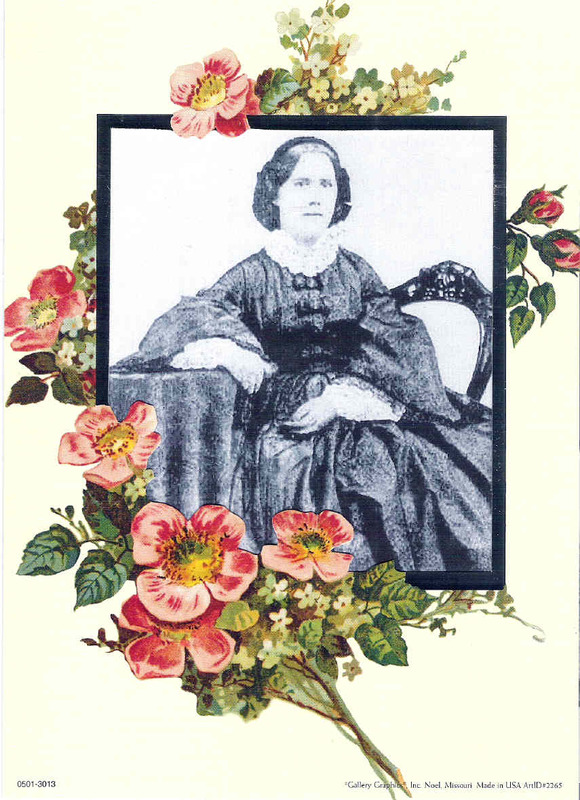 Little Abbie Potter, who was about 8 years old at the time of the murders, would, later in her adult life, paint an unhappy picture of the atmosphere in the Borden house, recounting tales Jane Gray, Oliver’s second wife had told about making an effort not to call on Abby at Second Street when the Borden daughters were at home, as Lizzie would pass through the parlor and continue straight past as if she or Abby’s sisters were invisible. Sarah Whitehead was only four years younger than Lizzie herself, and more of a daughter figure than half-sister to the much older Abby Borden. It is easy to see how Sarah and her young and needy family might be considered a threat and a rival to the two spinster Borden sisters- and possibly a threat to their father’s substantial wallet if Abby could prevail upon his generosity. George Whitehead worked as a teamster and cash was always short at the Gray/Whitehead home. Sarah Whitehead would be a widow only five years after Lizzie’s acquittal, at the age of thirty-four with the death of her husband George W. Whitehead- a widow with two children to raise. Sarah Bertha went to work in a harness factory at the age of 16 and worked hard, with few luxuries, all her life. Sarah Whitehead would live five years after Lizzie Borden died in 1927. The house on Fourth Street was inherited by Emma and Lizzie upon the death of their father, who was predeceased by his wife in whose name it was deeded. The Borden girls were advised it would be a seemly thing to sell Sarah Whitehead the house for a very nominal amount as it was the Gray homestead, after all. One wonders if this “stuck in the craw” of Emma and Lizzie to hand over the house which had inspired so much rancor back in 1887. If we are to believe all Little Abbie Potter said, it must surely have done so. Spring Street, during the time of Abby Borden’s tenure on Second Street, stopped at the east corner of Second and Spring, and did not go through to Third and Fourth Street. Abby Borden would be obliged to travel south on Second Street to Rodman St., turn left and walk a couple of blocks, taking another left on Fourth and walking north, to arrive at the Oliver Gray homestead where her half-sister lived. The Gray-Whitehead house was at the time facing on Fourth Street. It was later moved back a lot to the west, still facing Fourth Street but its south end facing on Spring Street, which is the location on the lot today. On August 4th, Abby Borden was to have taken care of her niece, Little Abbie while Sarah and George Whitehead attended the annual policeman’s picnic and outing at Rocky Point. Little Abbie’s brother George was to go to stay with Aunt Lucy, Jane Gray’s daughter by her first marriage to Obadiah Eldridge. Due to the illness of Abby Borden on Wednesday, these plans were changed, and forever after, those interested in the case have wondered if the outcome of the morning of August 4th would have been very different had Abby Borden been able to assume the care of her little niece. 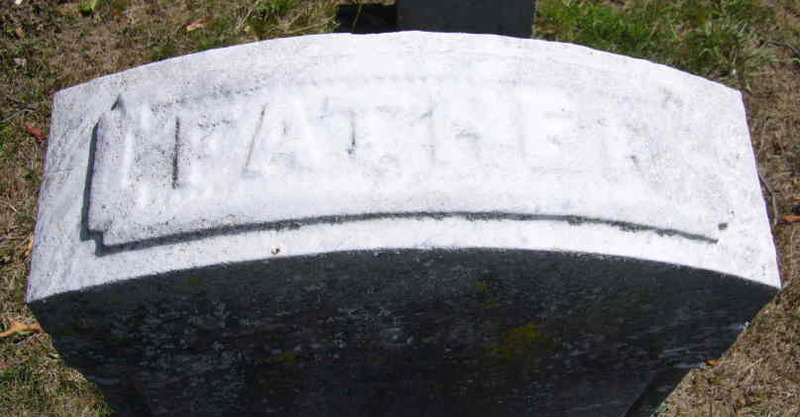 Sarah Bertha Whitehead’s mother, Jane E. Baker Gray (b. Nov. 14,1826)) was from Yarmouth, MA. (parents Sylvanus Baker and Berthian Crowell). She married Obadiah B. Eldridge ( born 1821, Virginia) on August 3, 1848 and had two children, Henry and Lucy Eldridge before her marriage to Oliver Gray in 1863 and birth of Sarah Bertha Gray in 1864. 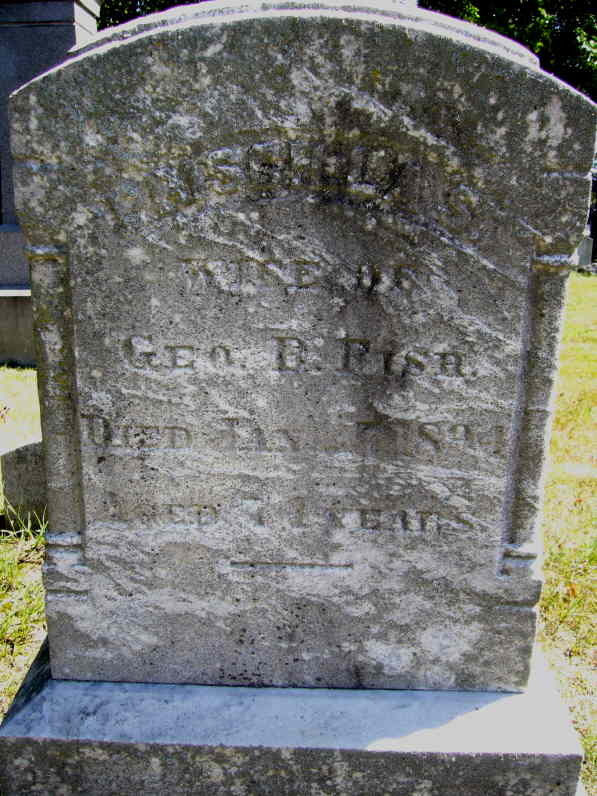 Jane’s son, Henry Eldridge, was a mariner who died young ( 1849-1882), while Lucy married a lodger who rented a room at the Gray house by the name of Elisha Cahoon. Cahoon was a cabinet maker. Lucy had worked in a cotton mill to supplement the family income on Fourth Street before her marriage. Sarah Bertha’s father, Oliver Gray was born in Tiverton in 1801 and died in August of 1878 at age 77, being 25 years older than his second wife, Jane. He is listed in the census as a tin peddler. 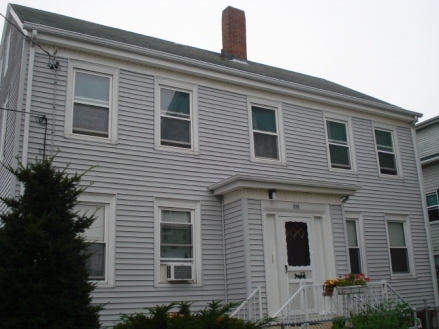 Jane Grey would eventually move into her daughter Lucy and son-in-law’s home at 125 Cottage Street in Fall River, leaving Fourth St. for good. There she enjoyed happy times with her granddaughters Minnie E. and Jeanie A. Cahoon. 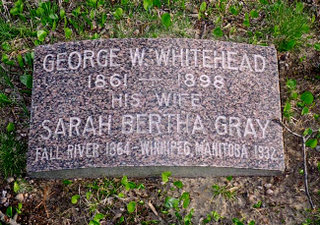 Sarah Bertha Gray married George W. Whitehead in 1883, and together had two children, George Oliver (named for Oliver Gray) born March 1887 and Abbie Borden born Jul 1884. “Bertie” was widowed in 1898, still living alone at Fourth St in 1910 taking in lodgers. Abbie Borden married National Biscuit Company executive, Charles E. Potter and left Fall River for New York, then traveled widely to Salt Lake City, Philadelphia, Toronto and Winnipeg before coming to live in Rhode island. The couple had no children. Abbie Potter died in 1974. Naturally, Abbie B. Potter’s sentiments regarding Lizzie Borden were highly colored by stories told her by her own mother and possibly her Aunt Priscilla Gray Fish. It is clear there was no love lost, in fact, every negative feeling comes through loud and clear. The incident of a tabby cat being killed by Lizzie is repeated by Abbie Potter in the same 1964 interview, and has become part of the Lizzie Borden legend. 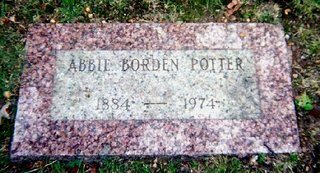 Abbie Potter attended the Borden double funeral on August 6, 1892 and recalled Lizzie being fanned by friends in the parlor. As a working girl she told of an incident when Lizzie Borden came into a cleaning establishment to settle a bill, and even though she knew the signature of Abbie Borden she gave no sign of recognition. Sister Sarah Bertha, “Bertie”, received about $1,000 and some of Abby Borden’s personal items and clothing after the funeral. Thanks to the 1964 interview, this glimpse of the personality of the victim, Abby Borden, is shared by Little Abbie, who describes her late Aunt as being a wonderful person who was always bringing baked offerings to the house on Fourth St., especially mince pies flavored with a touch of rose water. 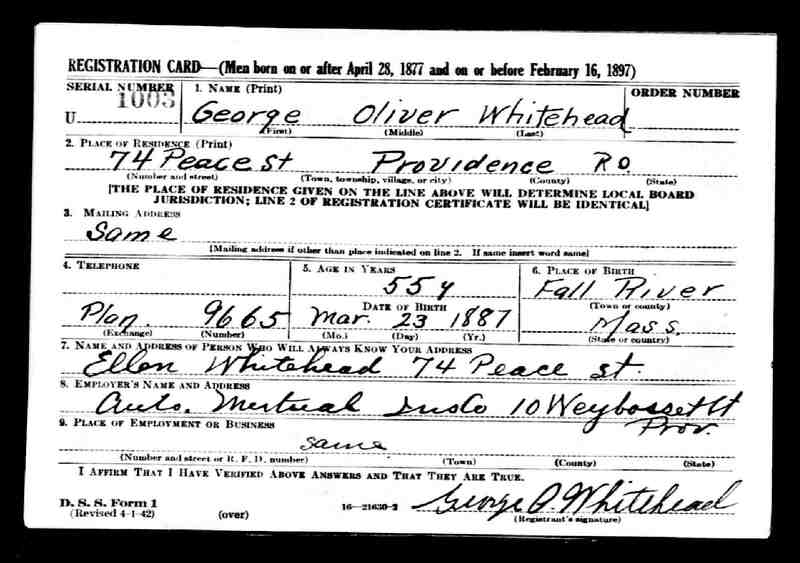 Bertie Whitehead’s son George Oliver Whitehead married Ellen Ford from Haverhill, MA and turned his hand to the printer’s trade while Ellen took up nursing. 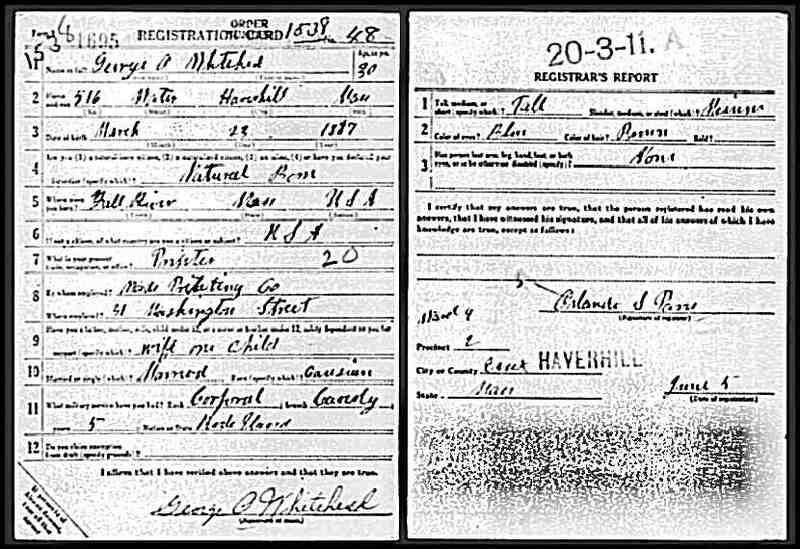 George O. registered for WWI and WWII. The couple lived in Haverhill, Lynn, and Swampscott before moving to Providence, R.I. where George was then working for Auto Mutual Insurance Company. In 1930 Bertie Whitehead was living with her son George and wife Ellen and her grandchildren Barbara J. and George O., Jr. in Swampscott. Bertie died in 1932. Abby’s full sister, Priscilla Gray Fish, ( born 1820) the daughter of first wife Sarah Sawyer and Oliver Gray, lived in Hartford, Connecticut at the time of the murders in 1892, and it may be presumed her visits were not frequent to Fall River to visit her sister Abby. Priscilla Fish attended the funeral of her sister Abby in Fall River on August 6th. Sarah Sawyer Gray was the mother of Priscilla Gray Fish and Abby Durfee Gray Borden. Oliver Gray, (1801-1878) son of Ellery Gray and Rhoda Bailey, was 18 when he married Sarah in Fall River in 1819. Daughter Priscilla was born in 1820, Abby in 1828. The 1850 census lists Abby as being 22, Priscilla had married and left home in 1840. It is not known whether other children were born to Oliver and Sarah between Priscilla and Abby, but it is likely there were other pregnancies during the eight year period between the births of the two sisters. 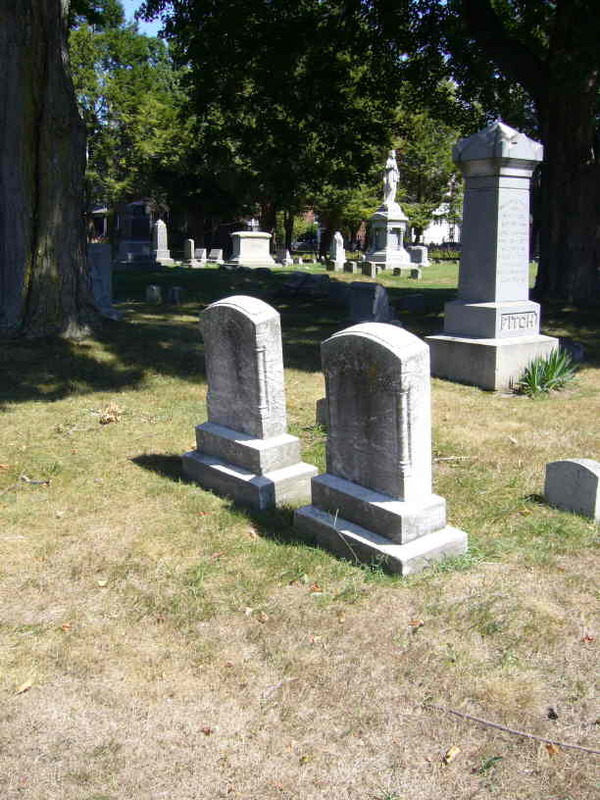 The incidence of miscarriage, stillborn births and infant deaths was high in the nineteenth century, and are sometimes unrecorded and graves unmarked. Priscilla married George B. Fish in Fall River on October 5, 1840 at the age of twenty. Husband George was born in Connecticut in 1818, the son of Cooke and Mary B. Fish. The couple are listed in Lebanon, CT in 1860, Torrington, CT in 1870, and Hartford, CT in 1880. They lived in Hartford at #20 Canton Street at the time of their deaths in January 1894. Priscilla lived but 23 days after George’s death. The house on Canton Street is no more and is today an apartment complex. 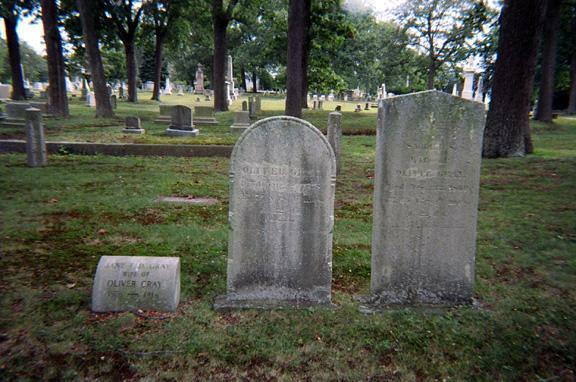 Priscilla and George Fish graves, Spring Grove, Hartford, CT.
Priscilla Gray Fish lived long enough to see Lizzie Borden acquitted in June 1893. She and her husband George B. 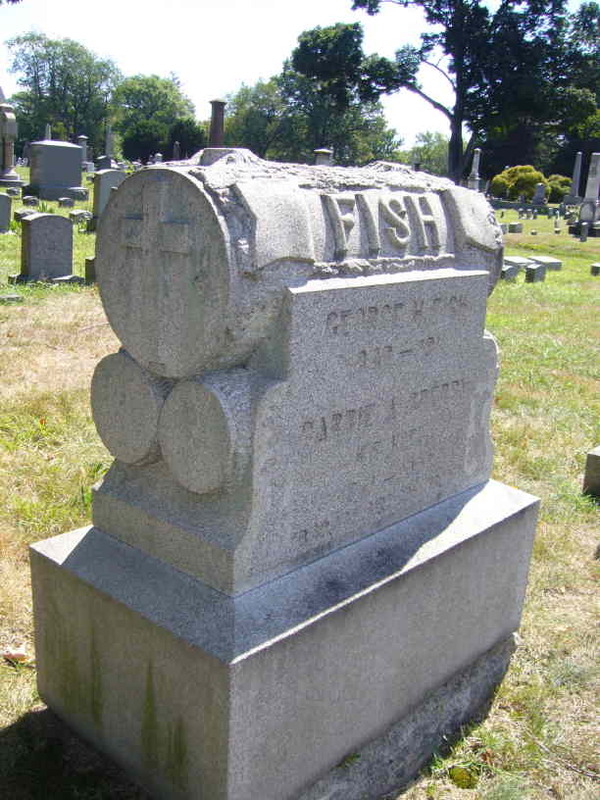 Fish are buried in Spring Grove Cemetery with their son and only child, George H.Fish ( 1842-1911) and his second wife Carrie Sperry (1841-1906) and their young son Harry. 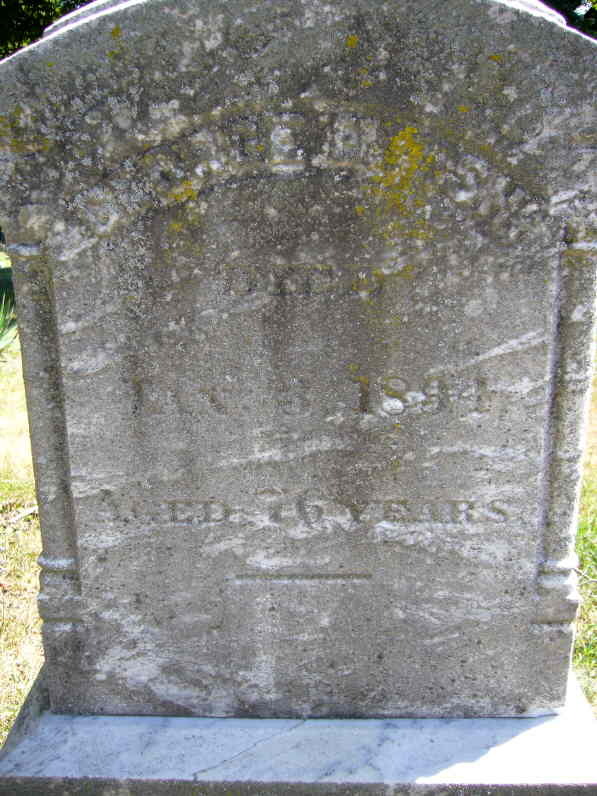 It is a mystery what happened to son George’s first wife, Adelaide M. Collins (1840-1918). 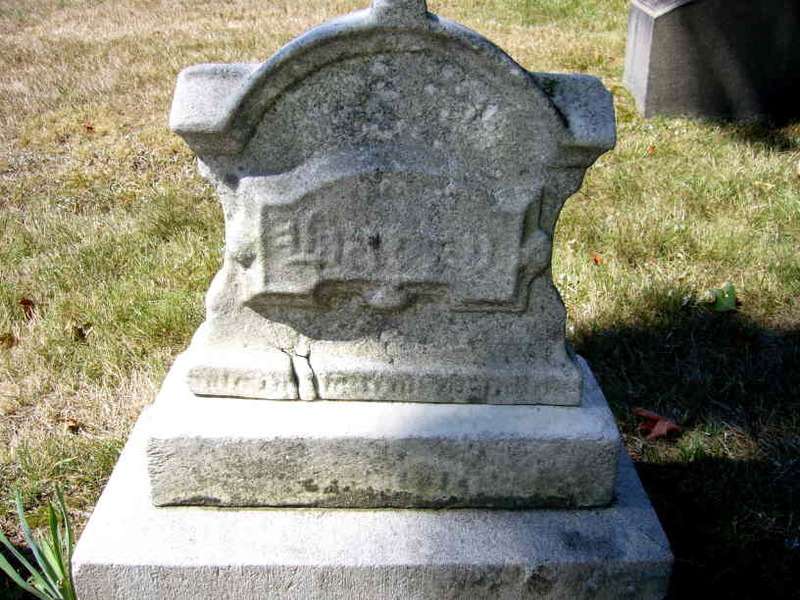 Adelaide died in Hartford at age 78. Divorce is the likely solution. Priscilla Fish’s husband George worked for the Talliman Railroad, a short trunk line which went to Long Island, and son George H. is listed as a freight shipping agent. George H. and Carrie would have two sons, Priscilla’s grandsons, Frederick Sperry Fish (born in 1871) and Harry B. Fish, born in 1872. Harry would die in 1874 as a two year old. He is buried near Priscilla and his parents in Spring Grove Cemetery, Hartford. Frederick became a locomotive engineer and married an Irish girl named Margaret in 1894. 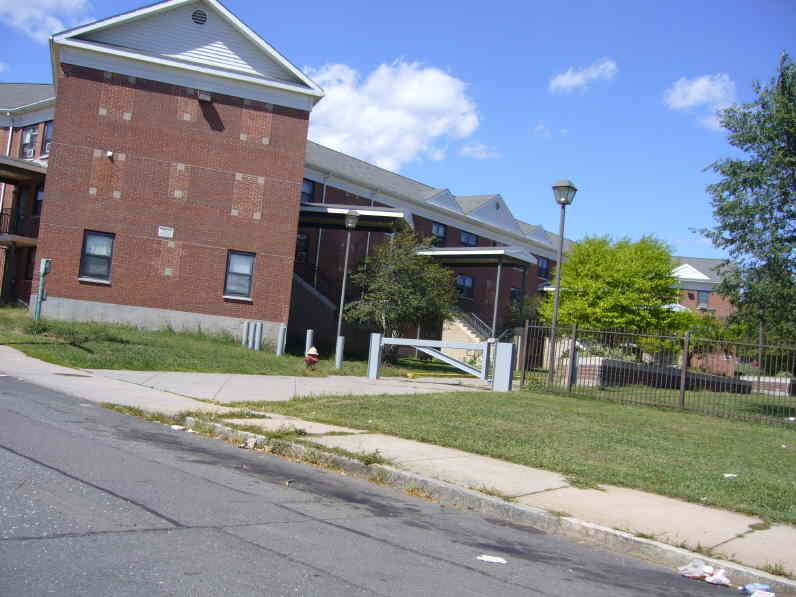 They lived in Meriden, CT and produced a son Raymond, and two daughters Carolina and Arline. Priscilla and her husband did not live long enough to see these children born. 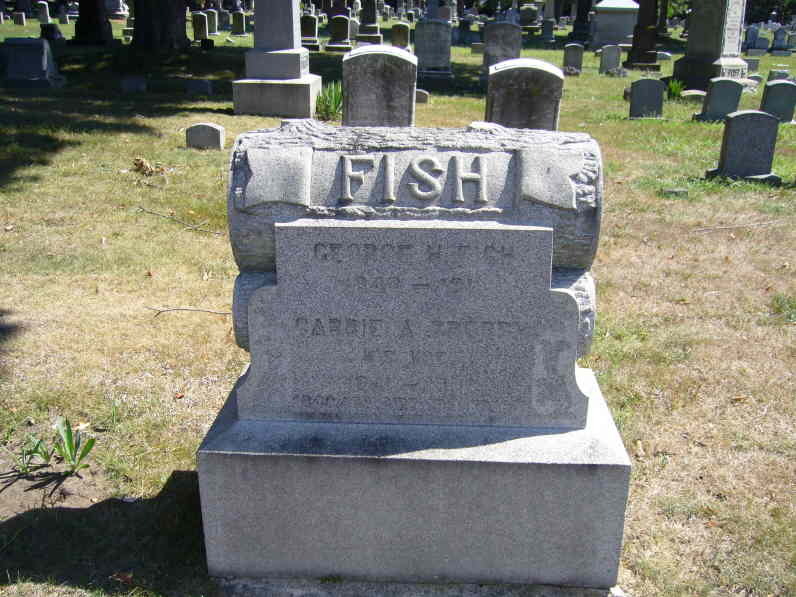 Fish is a common name in the old towns of Connecticut. No doubt the line of Frederick Sperry Fish goes on still. One might speculate about possible letters written by Abby Borden to her older sister Priscilla Fish in Hartford, describing her home situation back in Fall River. Considering the close relationship of Abby Borden with her young half-sister, and her close proximity on Fourth Street, it would be highly likely Abby would enjoy a confidential exchange about life with Andrew and his daughters at #92 Second Street. Just how much detail was divulged may never be known. Women having a good understanding of other women however, might lead one to surmise that Emma and Lizzie Borden would be aware that their stepmother had a close confidante and ally in her half-sister Bertie Whitehead and older sister Priscilla Fish. They may well have suspected that the topic of some conversations and correspondence among the Gray sisters included details less than flattering about themselves! After Lizzie was acquitted, it would be interesting to know what Sarah Whitehead and Priscilla Gray thought of the verdict, and how much, if any, conversation ever passed between them and the Borden sisters again after the house on Fourth Street was deeded over. Six months after Lizzie went free in the court at New Bedford, Priscilla would join her sister Abby beneath the sod-taking her opinions and suspicions with her. 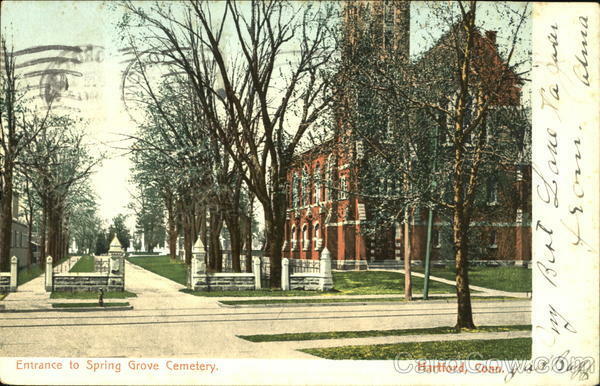 Acknowledgements and thanks to : The Hartford Historical Society, Spring Grove Cemetery, Hartford, CT staff, Oak Grove Cemetery, Fall River staff, Ancestry.com, Hollie B. Dziedzic ( Hartford photography), Leonard Rebello. You are the perfect person to publish a book on the buried dead at Oak Grove Cemetery. I can’t wait to go and visit the graves of the central people in Lizzie’s story and buy your new book. Maybe get an autographed copy! Many Blessings, Shelley. Thank you for a great article. I can’t imagine the time it took to find all the geneology on the family. I like reading articles about the “other side of the family” and what they thought. It’s almost as if I can see Abby bringing over mince pies or other goodies for them to enjoy. I always pictured Abby as being a very lonely person in the Borden house, hopefully she found some joy in her visits to Fourth Street. Thanks, Lorraine. I love digging through old records. The hunt for information is the most fun. I have always had great sympathy for Abby Borden. I have a step parent, a much-younger half sister with young children, and several Abby-like personality traits! And I married a thrifty New England Yankee from Cranston- so, I do have some small insight into her daily life. Often when reading about people and seeing only their names in print, one forgets the multi-dimensional dynamics which must have been ongoing in Abby’s extended family. I still have hopes of unearthing an interview by Priscilla Fish or George O. Whitehead some day! The family becomes very real when you start peeling back all the layers, and so often I find, families were not so different back then from what they are now.